For over a decade China has been globally recognized as the leading recipient of antidumping measures. On the other hand, China's use of antidumping measures is equally noteworthy. Xiaochen Wu's timely book takes a very practical approach as it examines its subject in a broad context. 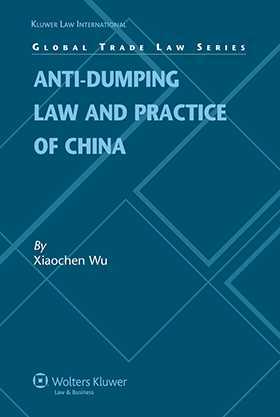 Besides providing a rich and detailed interpretation of the legal provisions, it discusses complex technical aspects of the Chinese antidumping law in a very pragmatic way, notably by providing actual instances of their application in the antidumping investigations conducted by the Chinese Ministry of Commerce (MOFCOM). This book is also very handy since it consolidates detailed statistics pertaining to Chinese antidumping proceedings since 1997 as well as all important legal texts including China's antidumping law and the 15 MOFCOM implementing provisions along with relevant legal interpretation. Readers will quickly discover that the book is thoroughly enriched with the thoughtful commentary and pertinent observations of its author. Having addressed and understood antidumping matters both from the public and private sector perspective, Xiaochen Wu provides a very unique and extensive analysis of the Chinese antidumping law and its practice. In sum, this work incorporates the essence of his personal experience as witnessed in the insightful examination of each antidumping provision and thoughtful reflections on complicated and exceptional situations which have come up in trade proceedings or which may very well arise in the not too distant future.